It is Sunday, and as you know, I am back on sabbatical. Sabbatical is where I stop attending church for a while so that the trauma doesn't overwhelm me. At least half of the year is sabbatical. The sun is shining like mad, a real contrast to yesterday. Yesterday was gloomy and misty but breezy, so I washed the bed linens and put them out to dry. In the afternoon I checked them and they were nearly dry, so I decided that I would leave them for another hour and get them in before my delivery shift. It started pouring with rain! I grabbed the washing and hung it up in my room. I went to the supermarket on the way to my delivery shift, and got groceries, seeing as I had a £15 voucher. The delivery shift was busy, and the thunderstorms moved in. It was quite exciting, driving through the torrential rain in the dark, with the thunder and lightning all around. 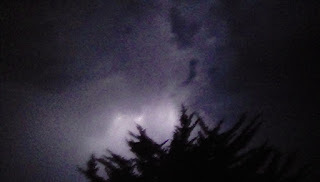 I had a good shift and came home, but the storms continued well into the night, and I was too excited to go to bed, so I had the blind open and sat in the dark, watching the lightning and drinking my cocoa. The lightning was strange because above us it was constant sheet lightning but over the hills and sea it was fiery forks of lightning. A lot of them were orange, not white. There were local lightning strikes, and one was quite serious. I got a good video of the storm but that won't post on here so I will post one of my not brilliant pictures.